Hundreds of 911 calls are answered every week, many of these calls are in your Flour Bluff and Padre Island communities. Vehicle accidents, medical emergencies, and even an occasional cat in a tree result in someone calling for assistance. The caller often is having his/her worst day and expects perfection of services from the public-safety personnel summoned. Firefighting can be a dangerous profession, and firefighters take pride in maintaining positive physical fitness, possessing knowledge of their equipment, and striving for perfection when executing their skill set. The firefighters in our community are no different. 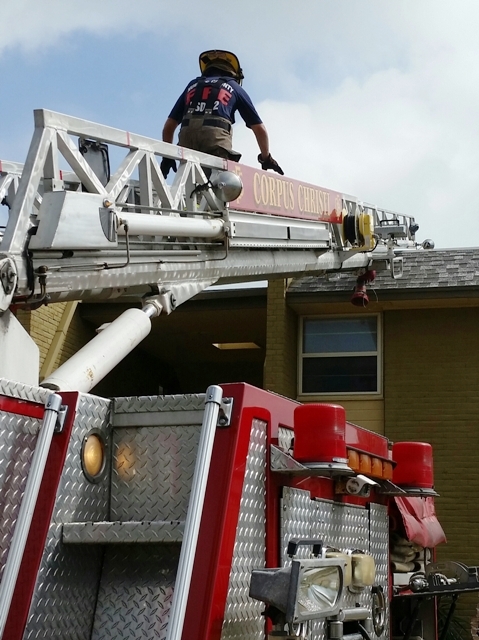 With the upcoming demolition of the Glenoak Apartments at 711 Glenoak Drive in Flour Bluff, firefighters were able to schedule and participate in a rare training opportunity. Firefighters from Nueces County ESD #2 (Flour Bluff Fire) and the Corpus Christi Fire Department found themselves in a very realistic training theater. In coordination with Amstar Inc. Contractor Services, firefighters were able to put their skills to the test, refresh on common tactics, and see some new equipment being used. 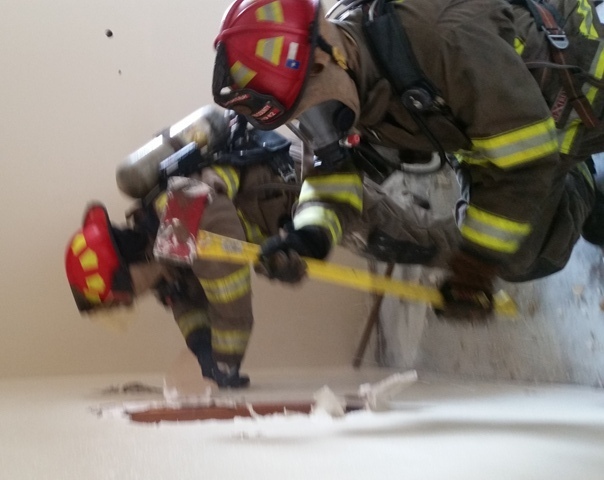 Because no residents are present during the demolition phase of the project, firefighters were able to practice forcible entry, a vital firefighting tactic. Teams of firefighters went door to door throughout the complex and physically forced doors open using tools and special tactics. This training is extremely important in learning to get to the location of a fire within a home as fast as possible. 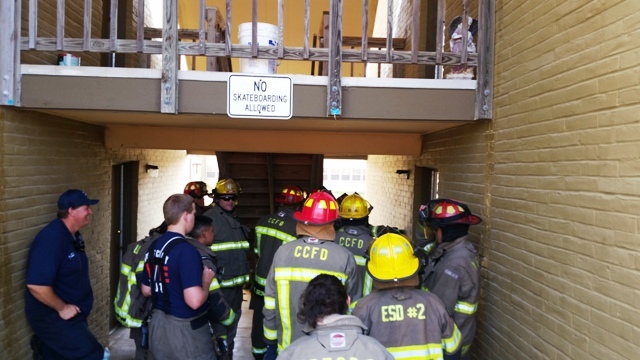 In addition to that essential training, firefighters were able to take part in one of the most significant training evolutions for a firefighter, firefighter survival. 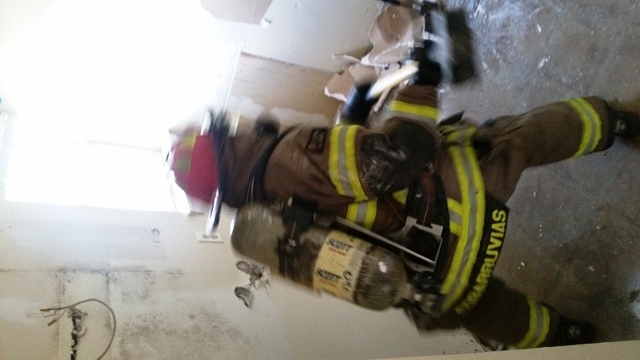 While in many cases firefighters complete daunting tasks, situations arise when even firefighters may become, disoriented, or in severe cases, trapped inside of a fire. Over 30 firefighters had the opportunity to practice and sharpen the skills of firefighter self-rescue and self-extraction. 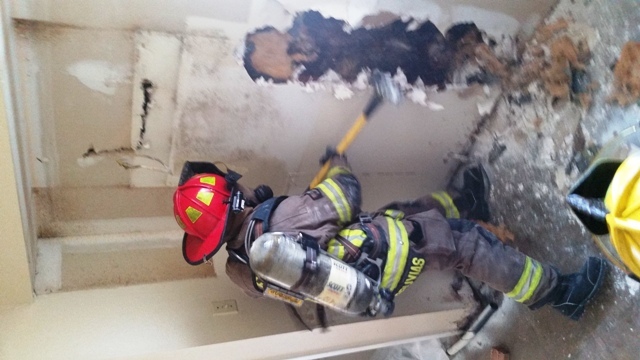 The personnel took turns breaking through interior walls and exterior windows and walls. In 2015, eleven firefighters in the United States died because they were trapped or disoriented while attempting to extinguish a fire. The training that these personnel participated in could very well be the training that gets them out of a burning home safely, instead of falling victim to a much more disastrous result. Firefighters answer every call they receive never completely knowing what situation they may encounter upon arrival. Citizens should take pride in knowing that the community in which they and their families live is protected by a well-staffed, well-trained, and well-prepared team of fire departments ready to answer whatever call comes their way. Weston is a firefighter, husband, and father of two boys. He is very active in his community, and is very passionate about his job. He works full time for NAS Corpus Christi Fire Department, and part time for the Annaville Fire Department and the Flour Bluff Volunteer Fire Department.